I love movies. Before having kids I would go to the theatre weekly as a way to unwind and escape! We are wrapping up the second round of the Cocorico Bee. It is a quilting bee I joined a few years ago. Amy is the last recipient in round 2. Needless to say, I was thrilled she chose "My Favourite Things" from The Sound of Music for her theme. I chose "Girls in White Dresses with Blue Satin Sashes". 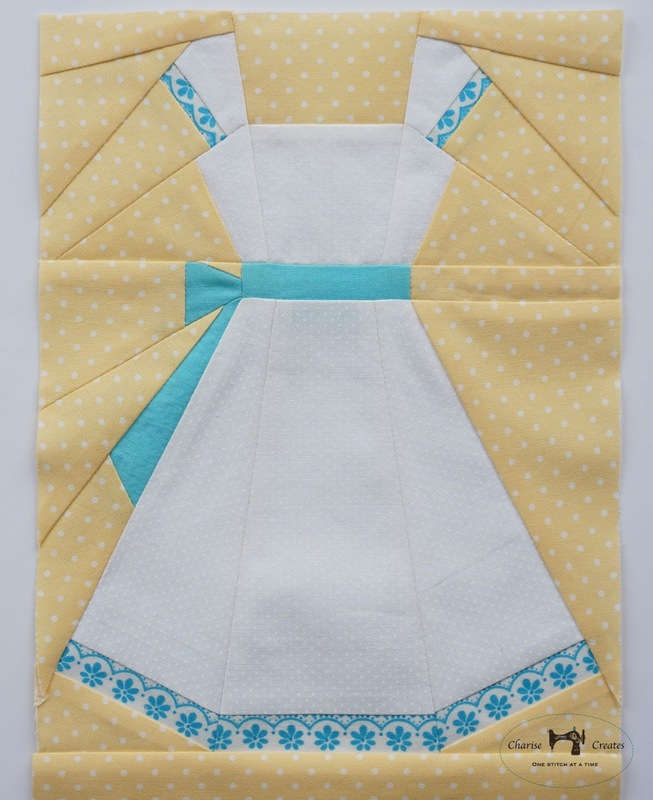 I used my Vintage Dresses Pattern as a starting point and made a few revisions to make it look a bit more like a little girl's dress. The white on white dot I have had in my stash. The yellow dot is from Lakehouse Drygoods "Lake House Favorites". The scallop is from an older Lecien Print. I LOVE these patterns. I have a quilt top partially completed using them! Thanks!! I had originally thought the scallops were from a fabric Amy screenprinted a few years ago, it looks very similar! That is so special! I just love your apron and that song? Oh, I loved it, esp the long version. What great years those were! I was thinking of another song, but I do love the Sound of Music! 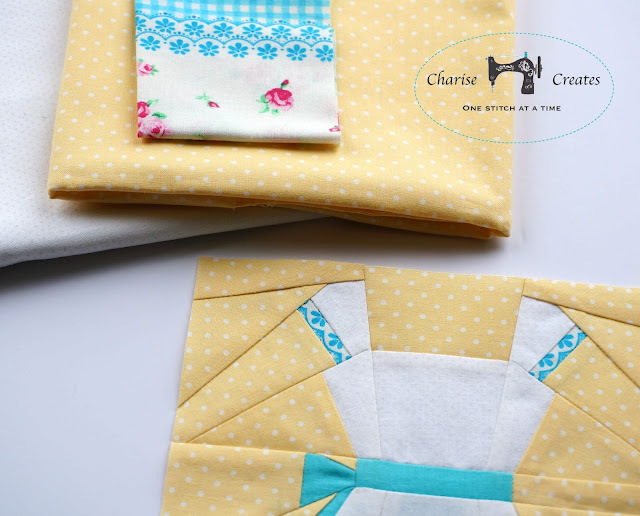 A beautiful block Charise - perfect. Very vintage, I really like it. The scallop, the sash, the bow - it's all very sweet and well balanced. Nice one! My favorite movie, too. Way back, in 3rd grade, I played Marta in the community play of Sound of Music. I'm still waiting for my 'pink parasol' to arrive. I missed this post in all the summer craziness! I love the block Charise! It's just perfection.